This entry is filed under Sweets and Snacks	and was posted on April 24th, 2009. You can follow any responses to this entry through the RSS 2.0 feed. You can leave a response, or trackback from your own site. You’re not looking through rose tinted glasses at all mate. They are not packets full of crisps nowadays, they are packets with some crisps in them. Part of the fun was trying to open them without losing too many on the floor! I seem to remember them retailing about 5p a pack…I remember there were some at 5p and some at 10p, depending on what they were. I’m glad I’m not the only one who thinks that packets of crisps these days are overpriced and under-crisped. Thanks for backing me up on this one Mark! I blame Walkers Crisps personally. They’ve bought up all the other crisp companies and even have the audacity to put cheese and onion crisps in blue packs and salt and vinegar in green packs. *EVERYONE* knows it should be the other way round! Back you all the way on this one….confused me for a while about the colour changing as well. Overpaid celebs advertising them too, need some way to recoup the costs – up the prices, reduce the content! Now that’s jogged a memory. I never had any of the Brittain’s space figures but I did have a fair bit of their farmyard toys. I wonder if I’ve still got them up in the attic? The space stuff is superb. They had hot fog flavour outer spacers for a very short run they were amazing. I always thought that they announced that space raiders were the name change of outer spacers and then gradually changed the packaging and flavours over the years. Chutney flavour Outer Spacers are the great loss of my life, I can still imagine their taste suprisingly well, even tho its been decades since I had any! Maybe this is because the flavourings used in modern foods, these days and then, is so synthetic it permenantly stains the taste buds on some genetic level. I’d still eat em tho, yum! Isn’t ‘Settling Space’ as they call it, licensed out per inch by Rupert Murdoch? Ah Outer Spacers! I don’t know about the 80s, but I well remember in the mid/late 70s buying them for 3½p a packet at Tesco. I’m sure I tried them all, but only remember the pickled onion space stations. And none of this letting the kids eat them as you do your shopping nonsense….I remember accidentally opening the packet (don’t know how!) and my mum going berzerk, thinking she’d be arrested for shoplifting! 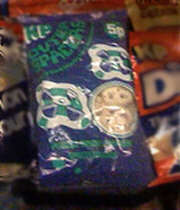 I remember these outer spacer crisps with much fondness, the chutney flavoured ones were my fav. the rockets too which I think were the beefburger flavour were really nice too. Just found a folder of cardboard models from KP Outer Spacers with 2 of the rockets and 1 spaceship still complete and not made up. I must have had to send off for them but I have no memory of doing it. I was pickled onion obsessed tho so collecting packets wouldn’t have been a problem. If I could figure out how to add pictures I would- not a social media guy here. I’m pretty sure that Alien Spacers were meant to replace Outer Spacers; the pack design, logo and concept was very similar and I don’t remember seeing Outer Spacers after that. Alien Spacers’ selling point (if you were the eight or nine year old target market like I was) was they were dyed a variety of lurid colours; red, orange and yellow. I’d assumed that the different flavour packs would contain all the same colour, but it turned out that you got all three colours in the same pack. Haven’t seen Alien Spacers for donkeys’ years. The bags were smaller though then and they had less air in them and probably went stale a lot quicker than today. My favourites were the beefburger flavoured outer spacers, the most wonderful taste ever and 5p a bag! Transform a snack are indeed similar but the texture is more fluffy and less dense and they are a bit too salty, but very similar Oh for some spankles and beefburger flavour rocket outer spacers.